The 44mm thick door leaf is comprised of high-density polyurethane foam, along with a timber sub-frame for extra strength. Aluminium inserts are also used on both sides to prevent the door from warping or bowing. The doors are then finished off with a 2.5mm GRP outer skin, which is completely immune to sun fade and bleaching. These high impact durable skins are injected with a 'through colour' process to ensure that no scratches or blemishes are visible. Super strong, high security, easy maintenance, excellent thermal efficiency, a lifespan of at least 35* years and the general look and feel of a composite door make it the most popular door choice on the market. Both sides of the door has a 2.5mm grp (glass reinforced plastic) outerskin that requires very little maintenance - only an occasional wipe clean with a damp cloth will keep the door looking like new and it will never require painting. 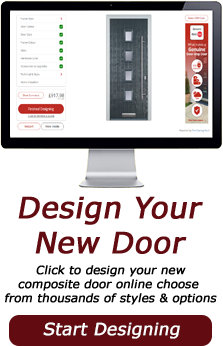 Composite doors have now become the preferred choice of entrance doors for many people due to the major advantages that Composite doors have over the alternative wooden doors, steel doors and UPVC doors. 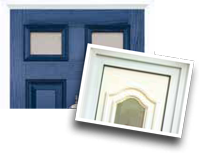 All our composite doors are supplied pre hung in a upvc outer frame that has energy efficient recycled reinforcement that offers excellent thermal properties. Someone clever once said that quality is in the detail. So what does that tell us about plain, white polystyrene-filled panel doors? The timber effect grain of one of our doors gives a rich, classic style to your house – and a very warm welcome home. Now that is clever. “I’d like a bright white door now, and then I would like it to go a kind of tired mustard, off brown colour after a couple of years” has never been asked for but often given with PVC panel doors. The GRP skins mean you will keep the colour you originally asked for.. The new woodgrain door is really GRP....honestly! After months of development our two tone ‘Dark Wood’ door complements both mahogany or a cherrywood foil frame. This woodgrain door is guaranteed to give this unique ‘is it real’ look for a decade. What’s in a door? Well, as you can see, there’s not very much at all between you and the outside world with a conventional PVC panel door. 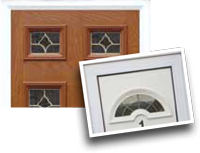 Our doors have a solid edge – to help keep you and your castle super-secure. Would you like your living room or your kitchen to look the same as everyone else’s? We thought not. But with PVC panel doors this limited choice comes as standard for the exterior of your home. Express your style with our wide selection of colour options.